Why I Recommend: I recommend this series because it shows the dark side of humanity and how we all struggle with this concept on a daily basis. It also touches on the idea of having a pre-determined fate or destiny which really makes the reader think: do we decide who we become or is our path already set? I also love twisted mind thrillers which give me chills. Though she is from a family of clairvoyants, Blue Sargent’s only gift seems to be that she makes other people’s talents stronger, and when she meets Gansey, one of the Raven Boys from the expensive Aglionby Academy, she discovers that he has talents of his own–and that together their talents are a dangerous mix. Why I Recommend: I recommend this series because I am very fascinated with the ley lines and the history that comes with this supernatural concept. This series also hooked me because of the complexity of the story and how all the different story lines flow together so easily. The writing is amazing and very descriptive. The reader can easily believe this world and loose oneself in it. This series is one of the few that I have revisited and found better the second time around. Why I Recommend: I love this series because it is so dark and complex. You think you are entering a world of monsters straight out of your nightmares (warning don’t read at night) but there is so much more to the story. The reader slowly finds out that the monsters one should be most afraid of are of the two-legged, breathing, thinking kind; better known as humans. Why I recommend: I recommend this book because once again it touches on the subject of having a predetermined destiny and the characters’ struggle with accepting this concept. The determination to reject this idea makes for a great story. I find being different, even in a modern evolved society, still infuses hatred and fear, which is very heart breaking and maddening. One of the best witch stories I have read. 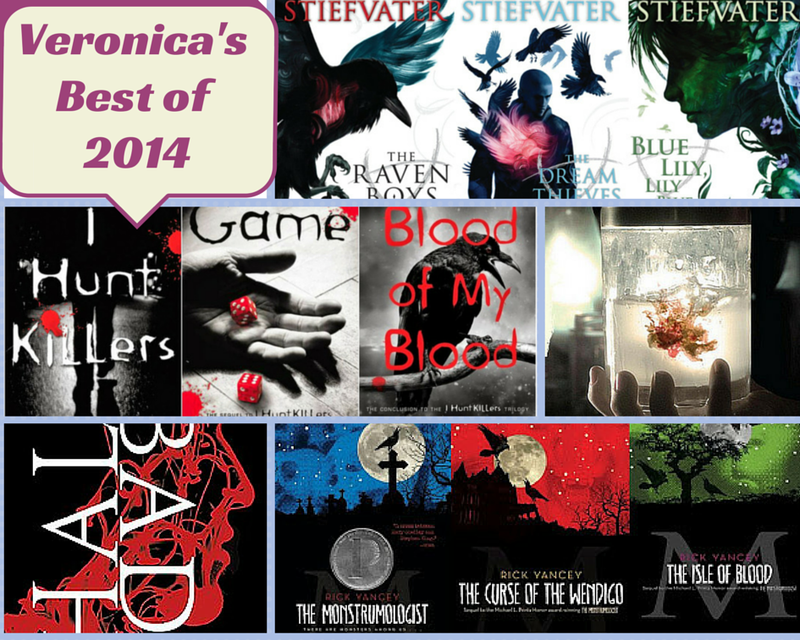 This entry was posted in Best of 2014, series, The Raven Cycle, young adult and tagged veronica. Bookmark the permalink.